A US-based Chinese-language website that has reported extensively on the Bo Xilai scandal in China says it was crippled for several hours by a concerted hacking attack. The Boxun website had to move to a new webhost after the denial-of-service attack on Friday, its manager said. Boxun has reported for several weeks on the scandal surrounding Bo Xilai. Mr Bo was removed from key political posts as his wife was investigated for the murder of a British businessman. Boxun's original webhost, Name.com, told the Associated Press news agency that the hack was one of the biggest in the company's history. It reportedly followed an emailed threat that it would be attacked if it did not disable the site. It is not clear who launched the attacks, but the manager of Boxun.com, Watson Meng, was quoted as saying he believed they were ordered by China's security services. A denial-of-service attack involves hackers paralysing a website by bombarding it with enquiries. Boxun.com, based in North Carolina, was set up 12 years ago by Mr Meng to campaign for human rights and democracy in China. 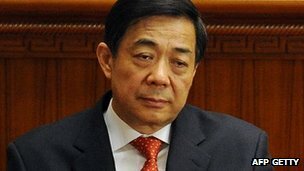 It has published a stream of reports and allegations about the fate of Bo Xilai, the politician at the centre of China's biggest political scandal in years. Mr Bo was sacked as Communist Party boss of the south-western city of Chongqing, and suspended from other key political posts, amid an official investigation into corruption and allegations that his wife was involved in the murder of UK businessman Neil Heywood. Mr Heywood was found dead in Chongqing in November 2011. China routinely blocks web content that it deems inappropriate, but reports on Boxun are often repeated on micro-blogging sites in China by people who use software to circumvent internet restrictions. The BBC's Martin Patience in Chongqing says that with more than half a billion internet users, China is finding it increasingly difficult to control the flow of information. Chinese authorities have stressed that their investigation into Mr Bo and his family is purely a legal matter.